Intensive diplomatic efforts continued around the final steps in Sudan’s peace agreement and on North-South arrangements should Sudan choose to split into two, facilitated by African Union High-Level Implementation Panel Chair Thabo Mbeki and with major U.S. involvement. Meanwhile the preparations for the Southern self-determination referendum face daunting logistical challenges. Even as the Sudanese Presidency issued a joint statement declaring “there will be no war,” the parties traded accusations of violating the peace agreement along the North-South border. While the South works on unifying dissident elements in advance of the referendum, reports of human rights abuses aimed at Darfuri activists in Khartoum as well as the closure of the Radio Dabanga offices, are highly concerning. The devil is in the technical details for the southern referendum: Registration materials have arrived in both Khartoum and Juba, with just over two weeks left before voter registration is supposed to begin. But, many other procedural issues remain unresolved and cannot begin without proper funding and political will. Abyei negotiations broaden to include all outstanding CPA issues and post-referendum arrangements: The resumption of Addis talks was postponed, but A.U. and U.S. officials continue to talk to Sudanese representatives to push the two parties toward a grand bargain that will involve trade-offs between the status of Abyei, oil-sharing arrangements, and border disputes, among other issues. Concerns over conditions in Darfur continue: Human rights violations and low-level violence continue to plague the people of the region while negotiations between the Liberty and Justice Movement and the government of Sudan continue in Doha. The U.N. Security Council turned its attention to Darfur recently, first with a high-level visit, then with diplomatic engagement in response to ongoing concerns about the evolving human rights and humanitarian situation in the region. Preparations for the southern referendum are slowly moving forward, but continue to be hindered by delays, leading Referendum Commission Chairman Mohamed Ibrahim Khalil to say that holding the vote on time would be a “miracle.” Although voter registration materials have reached Khartoum and Juba, and registration is due to commence on November 14 according to the final timetable, delays in the funding of the referendum commission have held up preparations for the vote. According to Under-Secretary-General for Peacekeeping Operations Alain LeRoy, these financial obstacles have “severely” limited the commission’s ability to hire the about 12,000 personnel needed for voter registration. The commission itself complained about budget shortages and criticized international donors, Khartoum, and Juba for not meeting their financial commitments to the referendum. In a statement, the Carter Center urgently called on the referendum commission to quickly train and deploy registration staff, establish the rules and regulations for voter registration, clarify voter eligibility, and expand voter education. In the South, President Salva Kiir has made a concerted effort toward unifying southern political parties and dissident armed actors in advance of the referendum. Kiir convened a conference attended by 23 political parties in the South—including prominent opposition leader Lam Akol—resulting in consensus around holding the referendum on time and respecting the result, and steps toward a new government in the South if it votes for separation. Kiir also issued an executive order offering amnesty to rebel leaders and other armed actors if they rejoin the SPLA. Among those granted amnesty were Major General Gabriel Tanginye, Lt. General George Athor Deng, Colonel Gatluak Gai, and David Yau Yau. Tanginye, formerly a member of the Sudan Armed Forces, or SAF, has accepted Kiir’s pardon and joined the SPLM while Athor welcomed the amnesty and is reportedly entering into negotiations with the South Sudan government. The rhetoric employed by both North and South has ranged from hostile to conciliatory. Although a joint statement from President Bashir and Vice Presidents Taha and Kiir “categorically affirmed that there will be no war,” the two Sudanese parties continued to trade accusations of both troop build-up and of initiating skirmishes along the North-South border. Sudanese Defense Minister, Abdel-Rahim Mohamed Hussein, said that the referendum should be delayed, only to later deny that he called for postponing the vote. Several days before, Sudan’s foreign minister said that Khartoum “won’t object” if the country's South votes for separation. Talks in Addis are reportedly restarting on November 6, with a series of meetings related to Sudan—including talks on Darfur and the IGAD summit that was relocated from Nairobi—also scheduled to occur around that time. Mbeki has reportedly met with President Kiir, presidential advisor Nafie Ali Nafie, President Bashir, and Ngok Dinka leaders among others. According to State Department spokesperson P.J. Crowley, Special Envoy Gration joined talks with Mbeki and representatives from the Sudanese government on Thursday, October 28 in Khartoum—the date when talks in Addis were originally supposed to resume. The two diplomats recently travelled to Juba to speak with southern officials as well. In recognition of the high level of tension in Abyei, UNMIS has redeployed 100 peacekeepers from other parts of the South to the area. U.N. Secretary General Ban Ki-Moon recently said he was “deeply concerned” about Abyei and that the lack of progress in referendum preparations “is exacerbating an already tense and volatile situation on the ground.” With the new migration season beginning, the security situation in Abyei will remain tense and unpredictable in the next months. Citizenship. According to reports from the Sudanese paper The Citizen, incremental progress has been made on citizenship and security arrangements post-referendum. 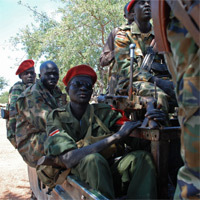 The article quotes Pagan Amum as saying, “Discussions on citizenship have progressed and we are at the stage of developing a general agreement that covers all the categories of our people without prejudice to developing specific agreements like movement of employees and payment of pensions.” Reportedly, a general framework on the integration of the SPLA and the status of Joint Integrated Units (joint North-South military forces) after the referendum was also established. In a recent briefing from U.S. officials, Special Envoy Gration made clear that the protection of the rights of northerners and southerners in both regions and establishing a path to citizenship are of “grave concern” to the administration. U.S. officials noted that there have been many “suggestions” for addressing the citizenship issue, and that although the two parties have committed to ensuring protection of citizens, discussions for contingency plans have also begun. The role of the U.S. in the current negotiations cannot be understated as it is widely understood among Sudanese, American, and other international officials that northern agreement on any new deal is contingent on the right incentives from the Obama administration. According to the latest fact sheet from the State Department, the incentives for fulfilling the two referenda and agreement on “key principles” for post-referenda arrangements would be additional U.S. trade and investment in Sudan in non-oil sectors and an exchange of ambassadors. President Obama’s renewal of economic sanctionson Monday is a signal that until the right benchmarks are met, the administration will not change its relations with the Khartoum regime. The situation in Darfur remains “fragile and unpredictable,” plagued by continued fighting between the northern army and rebel groups, periodic inter-tribal skirmishes, attacks on humanitarians and peacekeepers, and tensions in internally displaced person, or IDP, camps. Ongoing insecurity was exemplified by reports of thousands fleeing from the area of eastern Jebel Marra into camps in North Darfur, following continued attacks by the Sudanese army. There has also recently been a highly-alarming crackdown on Darfuri human rights and civil society organizations, including the arrest of ten human rights activists in Khartoum and the closure of the offices of Radio Dabanaga, one of the few sources of independent information on developments in the region. With the rainy season at an end, there remains serious concern about the potential for escalating violence. The government of Sudan moved forward with its plans for the region, including, reportedly, the implementation of parts of its new Darfur strategy. On October 18, the Sudan Tribune reported that a government committee on Darfur had endorsed an initial plan for IDP returns, though presidential advisor Ghazi Salah Eddin Attabati later noted that the government was still considering the details of implementation. The Libyan government, in support of the NCP’s plan to return the displaced, pledged eight million dollars to the cause a week later. Meanwhile, the Minister of Justice fired the government-appointed Special Prosecutor for Darfur, claiming the move was necessary to promote national reconciliation and justice mechanisms. The Special Prosecutor was replaced by the Minister’s Undersecretary who will be assisted by a commission consisting of, among others, members of the National Intelligence and Security Services, or NISS. The Ministry has now announced that it is planning on opening courts in each of the capitals of the three Darfur states. Against this backdrop, the U.N. Security Council traveled to North Darfur for a two-day technical visit on October 7. The council met with U.N. officials, community leaders, government representatives, and others, and toured an IDP camp around the capital city of El Fasher. During the visit, in which the council expressed concern over the level of violence in Darfur, attack jets of the kind that may have been used in assaults on Darfuri civilians were spotted in the vicinity of the airport. Although their exact purpose cannot be confirmed, one U.N. diplomat called their presence “suspicious.” This incident was followed by the arrest of two IDPs with whom the council had spoken during their visit. Since their arrest, the United States has reportedly been leading efforts within the council to resolve the problem, but a recent U.S. statement condemning the arrests suggest that the issue has yet to be resolved. In other U.N. news, the Security Council extended the mandate of the Panel of Experts tasked with monitoring the arms embargo for Darfur, with China abstaining from the vote over concerns regarding the panel’s work. China has expressed similar concerns related to the panel’s latest report which claims that Chinese ammunition was shipped into Darfur during the past year, and has attempted to block the publication of the report which is supposed to come out later this month. Amidst the controversy over the panel, the U.N. Secretary General released his own report on an equally controversial body: the A.U.-U.N. Hybrid Operation in Darfur. UNAMID, which is now facing threats from IDPs in the Zalengei area that they will dissolve their relationship with the mission should it choose to hand over the “Kalma Five,” continues to struggle in the fulfillment of its core mission. Peace talks between the government of Sudan and the Justice and Liberation Movement, or LJM, continue in Doha. According to reports, the parties are moving into the “decision-making stage” of negotiations, which means that the steering committee, which consists of top officials from the two parties, will begin reviewing the progress made by the five thematic committees and making decisions on points on which the committees failed to agree. The two parties will also discuss how to disburse the two billion dollars donated by the government of Qatar to promote development in the region, post-conflict. Meanwhile the Justice and Equality Movement, or JEM, which removed itself from talks back in May, announced that it would send a small delegation to Doha to discuss its requirements for rejoining negotiations. Topics to be discussed include the role of the mediator, the unification of smaller rebel groups, and the free movement of JEM’s leader Khalil Ibrahim between Darfur and Doha. The government has publicly stated its desire to see a peace agreement in place before the end of the year and has given the remaining rebel groups until then to join the negotiations.